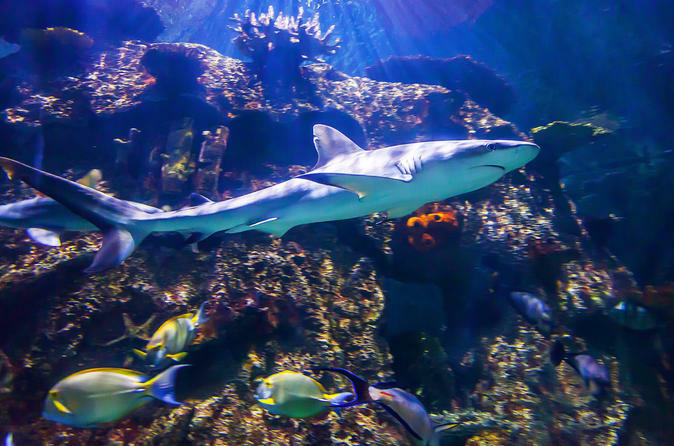 Enter the Shark Reef at Mandalay Bay Hotel and Casino on the Las Vegas Strip anytime during its open hours to witness an incredible array of aquatic and reptilian life. Shark Reef contains more than 2,000 animals in 14 exhibits, which offer Vegas visitors the chance to escape the desert heat and immerse themselves in a marine oasis. Observe more than 100 sharks from 15 different species, including Galapagos sharks, grey reef sharks and zebra sharks. See more than 30 sharks swimming in the 1.3 million-gallon (4.9 million-liter) main tank, one of the biggest in the US. Plus, observe a multitude of other sea life including angelfish, parrotfish, pufferfish, green sawfish, piranhas, arowanas, Moray eels and jellyfish. Check out the touch pool to feel horseshoe crabs and a variety of rays, and walk through two underwater tunnels for a more intimate view of the sharks and other marine life. Shark Reef is also home to reptiles such as green sea turtles, golden crocodiles, Burmese pythons and a Komodo dragon. Learn about all the fascinating species through educational displays as you explore Shark Reef at your own pace.